OXFORD has been left looking like a bike “graveyard” according to a transport expert criticising the city council for failing to clear abandoned cycles. 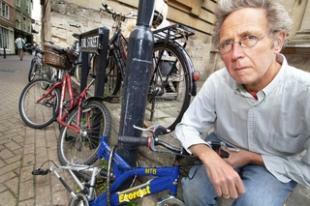 The chairman of Oxford Pedestrians’ Association, Paul Cullen, joined the Oxford Mail on a three-hour inspection of bike racks last week and discovered 40 abandoned bikes in the city centre. Mr Cullen said they were an “eyesore” – many of which having fallen victim to theft and vandalism with missing parts or buckled wheels. He also warned that the problem discouraged cyclists by clogging up overcrowded bike racks and deterring bikers who would be fearful of similar damage happening to their property. Although Oxfordshire County Council installs most of the bike racks, the city council is responsible for clearing up abandoned bikes. Last year the council said it removed about 300 bikes in Oxford, however our inspection uncovered an abandoned bike tagged by the council in November threatening removal if it was not claimed within 14 days. A ladies’ Raleigh cycle is still chained up in Broad Street almost seven months later. Our inspection showed the pavement in Turl Street almost completely blocked by bikes parked three abreast outside Jesus College. In March, Cyclox committee member Simon Banks published a report in which he calculated that 200 of the 1,194 cycle parking places in the city were blocked by abandoned cycles.